Alongside the more traditional ways of someone letting you know their at your door, ERA have a range of wireless door intercom systems that allow you to see, hear and talk with the visitor at your door - conveniently and safely from within your home. 95% of people surveyed said they would choose an Intercom for Security over convenience. The ERA intercoms all allow you to talk to someone outside your door without risking your home security by opening the door to strangers. All intercoms offer crystal clear two way sound and with an electronic door lock fitted, the intercom can be used to open a door automatically with the touch of a button. Ideal for the elderly or those in larger homes, enabling that two way conversation with the visitor making sure they know your home. 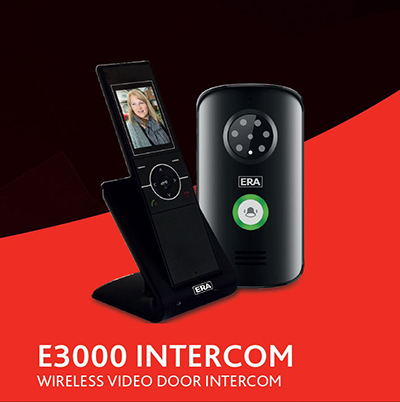 The ERA E3000 displays high quality live video and allows you to see and have a two-way conversation with the visitor at your door. The Auto Snapshot feature takes and stores your visitors photo as they press the Intercom Doorbell, giving you a record of who was at your door and when. Kit contents: Outdoor Camera Station (intercom) x 1, Portable Video Handset x 1, Handset Charging Dock x 1, Handset Power Adapter x 1, Installation and Operating Manual, all Fixings and Handset Batteries. 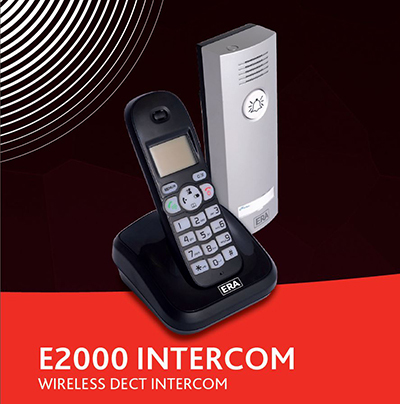 The ERA E2000 Wireless Digital Telephone Intercom system allows you to conveniently hold a two-way conversation with the person at your door without the need to leave your armchair. Kit contents: Outdoor Station (doorbell/intercom) x 1, Mounting Bracketx 1, Digital (DECT) Telephone Handset x 1, Base Station x 1, Handset Power Adapter x 1, Telephone Cable x 1, Installation and Operating Manual, all Fixings and Batteries. 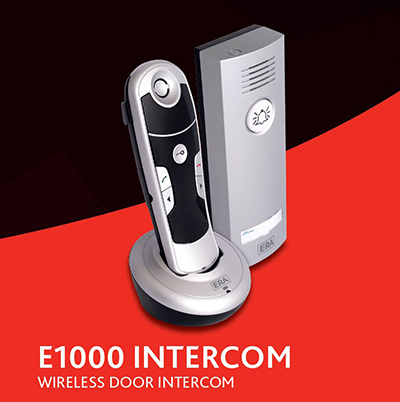 The ERA E1000 Wireless Door Intercom system allows you to conveniently answer your doorbell and speak with the visitor within the comfort of your home. Kit contents: Outdoor Station (doorbell/intercom) x 1, Portable Handset x 1, Handset Charging Dock x 1, Handset Power Adaptor x 1, Handset Belt Clip x 1, Installation and Operating Manual, all Fixings and Batteries.